testinganswers.com - One of the most popular software testing blog with best testing tutorials and interview questions. Latest and complete information on manual testing methodologies, automation testing tools and bug tracking tools. Exceptions in Java are objects. All exceptions are derived from the java.lang.Throwable class. 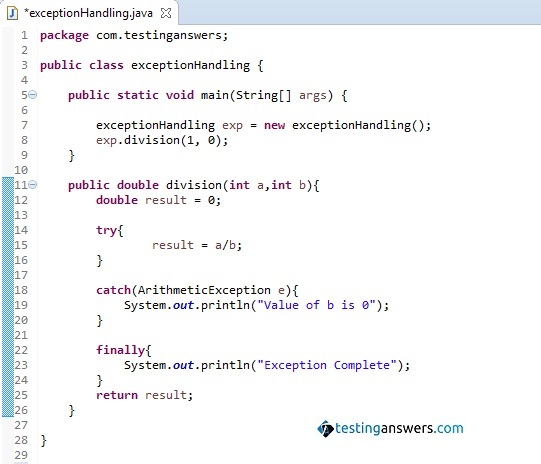 Exceptions can be handled in Java using try-catch-finally construct. Exceptions thrown by the try block of code is caught (handled) by the catch block. The following code shows an example of the try-catch-finally construct. Whenever an exception is thrown by try block of code, it looks for catch construct which handles that exception. If no catch construct is found which handles the exception, then the exception is handled by default exception handler. Catch construct is not executed if no exception is thrown or if the respective catch construct does not handle the specific exception. For example, in the code above, the catch construct only catches ArithmeticException. Any other exception, say FileNotFound will not be handled by this catch construct. Finally, the code block is executed, no matter an exception is thrown or not. An example for use of finally construct can be to write a code that closes DB connections. This will ensure that DB connection is closed, no matter an error happens or not during data retrieval from DB. © Deepak Singh. Simple theme. Powered by Blogger.